Weld inspection should not just take place after welding. Inspection before and during welding is critical. But what can you inspect if welding has not been performed? Take a look at the checklists below for pre, during and post weld inspection. Most of these items fall under the responsibility of the welding inspector, but any party involved should participate. The welder has the added advantage of being able to see the molten weld puddle. Experienced welders will be able to see if the required penetration is not achieved, if internal porosity is present, and identify other problems that cannot be detected without destructive testing or non-destructive testing such as radiography and ultrasound. Welders must learn to recognize weld puddle behavior that can indicate potential weld discontinuities or defects. Review drawings and specifications to determine if any special considerations, such as preheat is necessary. Ensure purchased material (base material and consumables) are those which have been specified. Check material test reports and chemical compositions against requirements. Check condition and storage of welding consumables. Low-hydrogen electrodes need special storage to prevent moisture pick up. Check the cleanliness of the joint. Excessive levels of rust, oil, dirt, paint and other contaminants are detrimental to weld quality. Check that proper welding procedures specification and welder qualifications are in place and up to date. If preheat is necessary, ensure it is done and measured correctly. Check that all parameters stated in the Welding Procedure Specification are being followed. These parameters include items such as wire feed speed, voltage, electrical stickout, welding technique, welding progression, travel and push angles, shielding gas, adequate preheat and interpass temperature (if required), etc. Check individual weld passes. If there is a multi-pass weld make sure each pass is adequate before placing the next weld. Problems can arise when welding over passes that have excessive convexity, trapped slag at the toes and other inconsistencies. If necessary, check that proper interpass temperature is being maintained. Interpass temperature is usually shown as a minimum, but some cases will also have a maximum interpass temperature. Check for visual cues that can indicate problems. This is the responsibility of the welder. Surface contaminants, low-melting elements and other things can cause a variety of problems. 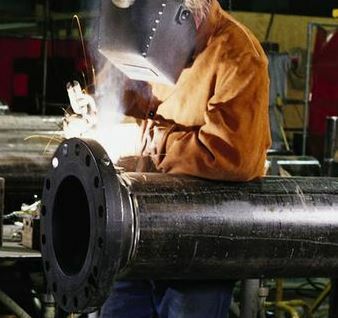 A welder can see if he is not getting adequate penetration, something that can’t be seen after welding unless ultrasonic, radiographic or other NDE tests are performed. Check weld appearance to ensure no inconsistencies or discontinuities are present. Check for adequate weld size. Check for adequate weld length, especially when intermittent welds are used. Select parts to be tested according to specifications. Check that postweld heat treatment is done properly, if necessary. A welding inspector cannot reasonably expect to be able to monitor all of this for every single station and weld performed. Therefore, it is critical that welder and other personnel are trained in all aspects of visual inspection. Identifying problems before welding can save a lot of time and money, do not limit your inspection until after welding. Do you have any other items that can be added to any of these checklist? You can get this book by clicking HERE. You can also search for it in the AWS website.